On our last trip to WDW, the stars aligned and we were able to fit in 3 days at Universal Studios Orlando. I have always wanted to take the kids to Universal Studios. We are big Harry Potter fans and I had always heard how great the Wizarding World of Harry Potter was. My biggest concern was food. Disney is just so awesome with gluten free food but I hadn’t heard the same about Universal. 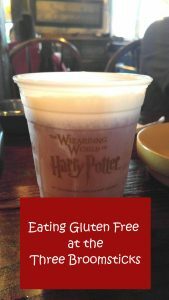 Since we really wanted the full Harry Potter experience, I looked into eating at the Three Broomsticks gluten free. For those of you who have never seen the Harry Potter movies or read the books, the Three Broomsticks is an inn/pub in Hogsmeade. Hogsmeade is a town outside of Hogwarts, the school attended by all the young wizards in the book and the movie. The students at Hogwarts get to have day trips to the town so the Three Broomsticks is seen often in some of the Harry Potter movies. 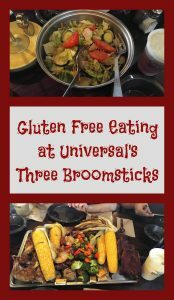 I really couldn’t find a huge amount online about eating at the Three Broomsticks gluten free but we really wanted the full Harry Potter experience. As we walked into the restaurant we were met by a greeter who asked if we had any questions. That was our first opportunity to tell someone about our glute free requirements. He talked to us about the menu a bit but couldn’t really give us any information about eating at the Three Broomsticks gluten free. He did direct us to a particular cashier who would be able to help us. So after speaking with the cashier, I didn’t really feel as though I had gotten thorough answers to my questions and she had no gluten free menu to show us. She tried to be very helpful but just wasn’t sure about the gluten free options so we both decided it was best if I spoke with the chef. The chef came out right away and was very helpful. We decided to order the great feast platter for four. The chef assured us that she would oversee the preparation of our food and that everything would be fine. After paying, we were directed to another counter where we received a numbered sign and our drinks. We then proceeded to a vacant table to wait for our meal. Although the restaurant is a quick service, it has a sit down feel. A server brings your food to the table and gets you anything you need after you place your order. While waiting for our food, we really got the chance to look around. This place is amazing! The attention to detail was perfect. There is a very rustic vibe to the place with wavy glass in the windows, mismatched chairs and a huge wagon wheel light fixture. If you look up to the ceiling it really looks like it could be an inn, just like in the movies, with stairs and bedrooms upstairs. The fireplace also looked right out of the movies. It did take a little while for our food to come. It felt as if it was taking longer than the people around us. This is not unusual when ordering gluten free food so I took it as a sign that our food was being specially prepared, which was good. The chef did come out at least twice to ask how we were doing and to let us know our food would be coming out soon. I really appreciated her attention because it made us feel like they were being thorough and hadn’t forgotten us. The first item to come out was the salad. 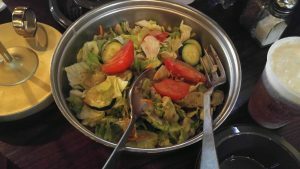 It was a simple salad with lettuce, tomatoes, cucumbers, and a vinaigrette dressing on top. Even though it was simple, it was fresh, colorful and crunchy. It was not at all soggy like other salads I’ve had in other restaurants. Very quickly after that our platter came out. I have to say I was very impressed with the presentation. The bountiful amount of food comes laid out on a huge platter. 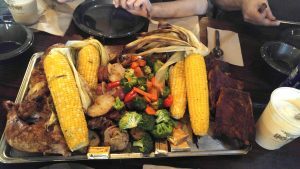 The platter included rotisserie smoked chicken, chargrilled ribs (with no sauce because it has gluten in it), roasted corn on the cob, seasoned roasted potatoes and mixed vegetables. The rotisserie chicken had the skin removed, which was very helpful. The seasoning was very flavorful. I definitely tasted some rosemary. Unfortunately, my husband hates rosemary so I wouldn’t say this was his favorite meal. He did manage to eat the corn and some of the chicken. The rest of us don’t mind rosemary so that wasn’t a problem. The ribs were very spicy so only my one son and I liked them. This may have been because the ribs were really meant to be served with a bar-b-que sauce that contained gluten (and so was left off). The corn on the cob really stole the show. It was juicy and sweet with no need for butter. I have to be upfront and say that our family, in general, really doesn’t like a lot of spices in our food. Although we all enjoyed the experience and the food was ok, it was very seasoned. I think a normal family would have found this delicious. However, if you prefer bland food this would probably not be your best choice. I also want to say that the chef came out twice to make sure everything was ok with the food after we were served. She seemed to be really on top of things. You can’t visit Hogsmeade without having a butterbeer. So, of course, we all ordered cold butterbeer. Luckily it’s gluten free. There are actually now 3 versions of butterbeer, cold, frozen and hot. Cold butterbeer went best with dinner but later on in the night we ordered some frozen butterbeer. I liked the frozen butterbeer better (say that 5 times fast!) 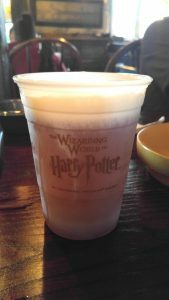 but the boys liked the cold butterbeer and got it a few more times during our 3 day trip. I thought the cold butterbeer was a little too sweet but was more subdued in the frozen version. It definitely reminded me of cream soda with a hint of butterscotch and homemade whipped cream on top. After finishing all of our abundance of food, we really weren’t in the mood for dessert. I did see butterbeer ice cream on the menu, which is gluten free. Unfortunately, we were stuffed and ice cream doesn’t transport well, so we decided to skip dessert. 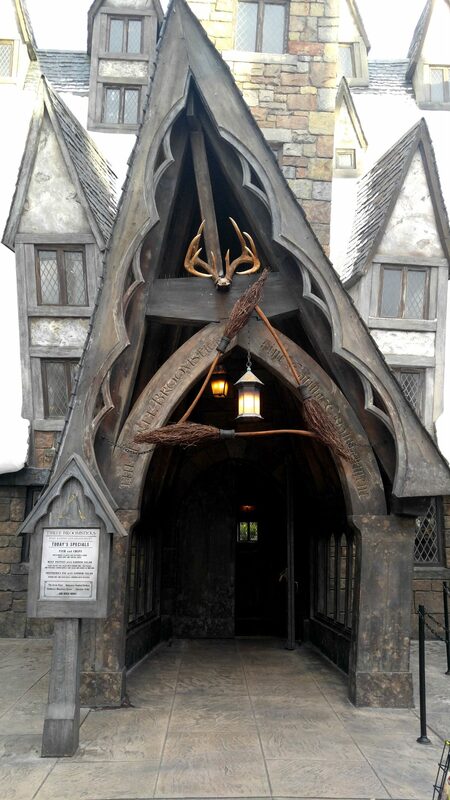 Overall, we were glad that we went to the Three Broomsticks and would go back again. No one got sick the next day, which is the most important thing. I really felt that they were very conscientious in keeping our meal gluten free. 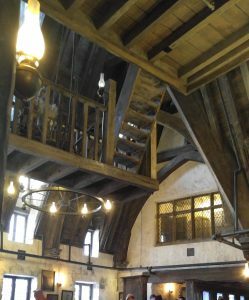 Actually eating at the Three Broomsticks was an unforgettable experience. You really felt like you were in the Harry Potter movies. The food was pretty good, especially the corn. However, if you really like bland food, I wouldn’t recommend ordering the great feast. I absolutely loved visiting the harry potter world at universal. My husband and I need to go again since we haven’t been in 4 years. The butter beer is sooo good! Yes, we were so amazed by the Wizarding World! I am a huge Harry Potter fan and the details were incredible.